Firefighters face uniquely extreme asbestos exposure risks, and as a result, they suffer an elevated rate of asbestos-related diseases such as mesothelioma. Many organizations support firefighters with occupational cancer and work to prevent toxic exposure in the future. When people imagine the dangers of firefighting, they often don’t realize cancer is now the No. 1 occupational cause of death for career firefighters. While a soot-covered set of overalls serves as a sign of a proud and brave firefighter, rescue workers should see that visible grit for what it really represents — potentially deadly asbestos contamination. During America’s 20th-century building boom, asbestos-containing materials were ubiquitous in public buildings and residential structures — from basements to attics. Most manufacturers phased out the use of the toxic mineral when its link to terrible illnesses, such as lung cancer and mesothelioma, were publicly revealed, but asbestos still remains in millions of old buildings across the nation. When buildings burn, weakened asbestos-containing materials can release intense concentrations of toxic mineral fibers into the air. Firefighters must use their safety equipment at all times at the site of a fire and then decontaminate their gear properly. If not, they risk exposing themselves and their families to asbestos and other toxic substances found in ashes and debris. Many trade organizations provide training and informative resources so firefighters can learn how to prevent occupational cancer. Other organizations specialize in supporting firefighters stricken with cancer. Firefighters who have suffered toxic exposure because of others’ negligence have legal options for seeking compensation. When asbestos is disturbed, it releases dust fibers more than 100 times thinner than a human hair. These microscopic mineral fibers cannot be seen, smelled or tasted. Because they do not chemically react with anything in the body, they cause no immediate symptoms when someone inhales or swallows them. However, because asbestos fibers never dissolve inside the body, they can become permanently lodged in organs and tissues, causing benign and malignant illnesses to develop many years later. When asbestos collects in the soft tissue of the lungs, scar tissue may build as the immune system tries to expel the fibers. The buildup of scar tissue gradually stiffens the lungs, making it harder to breathe as the asbestosis progresses. Lung cancer is usually caused by smoking tobacco products, but each year, many thousands of cases also trace back to asbestos exposure. Asbestos-related lung cancer kills more Americans than any other asbestos-related illness. Once inside the body, asbestos fibers can also migrate into the pleura, which is the tissue lining around the lungs. Irritation from lodged asbestos fibers may lead to development of hard plaques or scarring in the two layers of the pleural lining, which can make breathing painful. Mesothelioma is a rare and aggressive form of cancer caused by asbestos exposure. Most cases affect the pleural lining, endangering the lungs, heart and chest wall, but a large fraction of cases develop in the peritoneal lining of the abdomen, potentially spreading into the organs of the gut. Our Patient Advocates can answer your questions and find you an attorney. 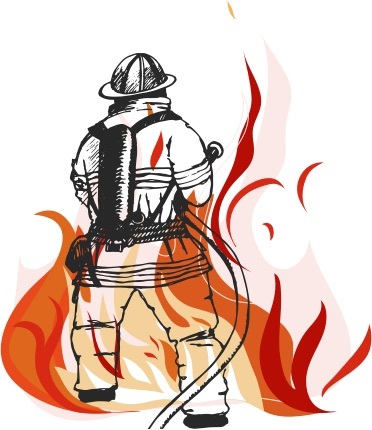 In 2013, the Occupational Health and Safety Administration (OSHA) announced a novel finding from its research study into the medical history of almost 30,000 American firefighters. 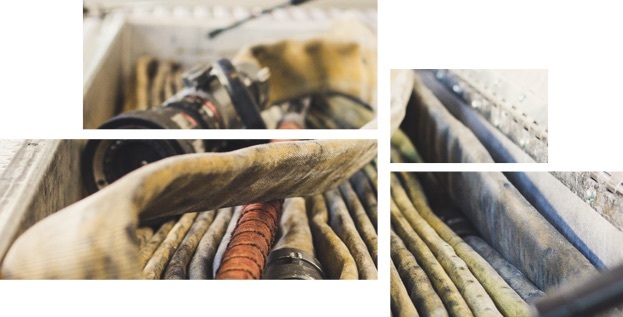 Compared to the average American, firefighters are more than twice as likely to develop mesothelioma, the signature cancer of asbestos. According to the OSHA study, firefighters also face elevated rates of many other types of cancer because of toxic chemicals released when a building burns. However, the extremely high incidence of mesothelioma found by the study points to the risky type of occupational asbestos exposure firefighters face. From the 1930s to the 1970s, American manufacturers mixed asbestos into a range of building materials as a cheap way to make almost anything more durable. The list of asbestos products goes on. In most circumstances, these materials fall into two categories: Friable materials (such as old pipe insulation) that can release asbestos fibers easily, and nonfriable materials (such as vinyl tiles) that keep asbestos fibers fixed in place. In a disaster situation, however, all materials are effectively friable. This is what sets firefighters apart from other tradesmen at risk of asbestos exposure. Most occupational asbestos exposure happens little by little on a regular basis. But for firefighters, exposure may come in the form of a single encounter with asbestos-contaminated smoke or debris. When the towers of the World Trade Center fell on 9/11, they released a massive dust cloud of heavy metals, burning plastics and hundreds of tons of pulverized asbestos. In the following months, thousands of firefighters from across the country joined the members of the New York Fire Department in digging through the contaminated rubble, often without respiratory protection. As a result, first responders exposed to WTC dust suffer high rates of fatal lung diseases and dozens of different types of cancer. The death toll is set to rise for decades to come because many types of cancer, including mesothelioma and asbestos-related lung cancer, typically do not develop for at least 20 years after exposure. The toxic exposure tragedy caused by the 9/11 attacks illustrates the absolute necessity of wearing personal protective equipment (PPE) at all times around a disaster site. How Can Firefighters Avoid Asbestos Exposure? 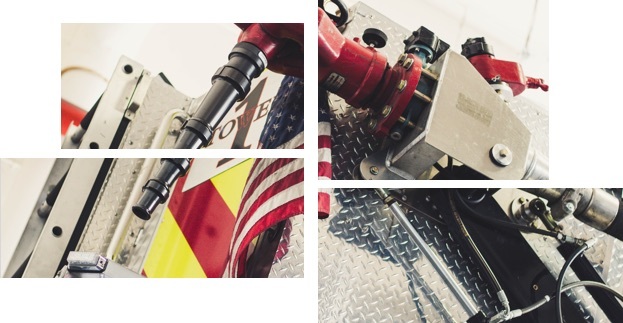 In 2013, the Firefighter Cancer Support Network (FCSN) assembled a panel of experts to create a detailed list of ways firefighters can protect themselves from occupational cancer. By following these key recommendations, firefighters can guard against benign diseases such as asbestosis and pleural thickening as well. It is essential to wear respiratory protection at all times during a firefighting operation. Many firefighters inhale asbestos and other toxic substances because they only use their self-contained breathing apparatus (SCBA) when there is an immediate threat from fire and smoke. Opening walls, pulling down ceilings and searching through debris in the aftermath of a fire are precisely the types of activities that can disturb weakened asbestos materials and stir up toxic dust. Keeping debris wet can minimize the amount of dust in the air. Before leaving the site of a fire, firefighters should wash the bulk of the hazardous soot off their tools, personal protective equipment and skin using wet wipes or a hose. After leaving the site, firefighters should decontaminate PPE according to the National Fire Protection Assocation standard (NFPA 1851) at the station or sending dirty PPE to an appropriate cleaning facility. Firefighters must decontaminate storage areas for PPE as well. Firefighters must keep contaminated PPE and clothes isolated from living and sleeping quarters. To avoid secondhand asbestos exposure, firefighters should shower at the station before returning home to their families. In particular, volunteer firefighters must change and wash their clothes immediately after a fire, and they should avoid bringing contaminated gear and clothes into their cars and homes. Proper training is crucial to avoiding asbestos exposure. If fire departments do not take the initiative in offering training, firefighters must be proactive in requesting it. The Firefighter Cancer Support Network, International Association of Fire Fighters and other groups offer cancer awareness and prevention courses at fire training academies, fire service conferences and online. These organizations also offer training instructors can take back with them to their local fire departments. Unfortunately, asbestos exposure is also a danger to firefighters in nonemergency situations. Firefighters have often encountered asbestos-containing materials when making repairs to old firehouses and preparing abandoned buildings for training exercises. The intentional burning of a building for fire training is considered a demolition as far as federal asbestos regulations are concerned. That means the building must be inspected and asbestos materials must be properly removed before the fire training. Even the most thorough precautions will not remove all the environmental hazards firefighters face or reverse the effects of past toxic exposures. For this reason, firefighters should receive annual medical examinations. They should keep their doctors informed of exposure to any toxic materials. Early detection is essential to the effective treatment of occupational cancers such as mesothelioma. How Can Firefighters Be Compensated? The link between cancer and firefighting has been well established in the scientific community. The government is starting to catch up by offering workers’ compensation, medical benefits and death benefits. Although coverage and criteria vary by state. At the federal level, the government passed the Zadroga Act in 2010 to create the World Trade Center Health Program. It was created in recognition of the lung conditions caused by 9/11 and other long-term effects. In 2015, the health program’s funding was extended for 75 years to ensure lifetime medical treatment and monitoring for people exposed to the toxic dust of the fallen towers. Today, the program tracks the health of more than 70,000 rescue workers and survivors. All firefighters who participated in the 9/11 recovery operation are encouraged to enroll in the World Trade Center Health Registry. Previously, New York City first responders were forced to seek compensation by filing a lawsuit in 2003. The basis of the complaint: Government officials had not provided sufficient warning about the dangerous chemicals in the 9/11 dust and debris. In 2010, the city offered a $657 million settlement that would be distributed among about 10,000 claimants based on each person’s severity of exposure and illness. Firefighter lawsuits have also arisen because of asbestos exposure in training exercises. In 2010, for example, 49 firefighters sued the city of Everett, Washington, over an asbestos exposure that occurred in July 2007. Though at least one fire official knew the city-owned homes they were training in contained asbestos, officials did not warn the firefighters nor direct them to wear SCBA. In 2011, the city settled the lawsuit by agreeing to pay for lifetime medical monitoring and medical costs up to $750,000 for the 49 firefighters. Fire departments and government officials have an ethical responsibility to protect firefighters from asbestos. On a practical level, making the effort to prevent toxic exposure is much less costly than dealing with the terrible long-term consequences of occupational cancer. In September, the Hawaii Occupational Safety and Health Division fined the Honolulu Fire Department $7,000 for failing to follow proper decontamination procedures after a fire. In October, the Occupational Health and Safety Administration levied a $33,000 fine on the city of Gastonia, North Carolina, after firefighters conducted training exercises with asbestos materials in an old department store building. The city of Orlando narrowly avoided fines over a similar situation that occurred in February. In November, the city administrator and the fire chief of Marion, South Carolina, were indicted on several charges after it emerged they had allegedly ordered firefighters to remove asbestos materials from a fire department building without proper training or safety equipment. Caruso, David. (2010, Mar. 11). NYC to pay up to $657M to settle WTC health cases. : Retrieved from: http://www.guardian.co.uk/world/feedarticle/8985756?